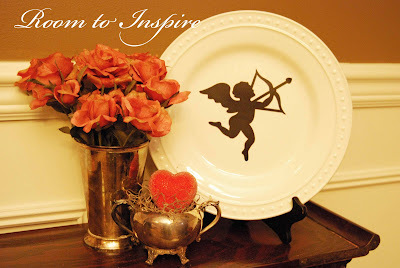 Here is another Valentine's Day project using the Silhouette (I am lovin' this machine)! This one is another super simple, inexpensive idea. I downloaded the cupid image - yep, you guessed it, for .99 cents. 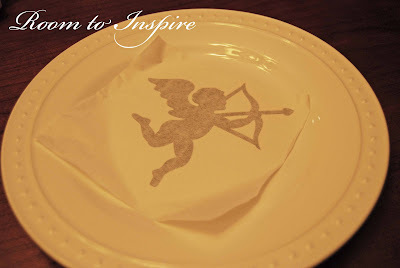 I then laid it out on my white plate (I already had it in on hand). and really, voila! Super easy and instantly festive. If you haven't already, be sure to head over and enter the Silhouette Giveaway! ($175 with a subscription commitment to the Silhouette Online Store) be sure to use the promo code "INSPIRE". What a great little Valentine's Day decoration. Love it! I'm hoping to win a Silhouette but something tells me I'm going to have to buy one! I just got mine in last night! This is a perfect project for it! Thanks! Are you on a roll or what, Chelsea! 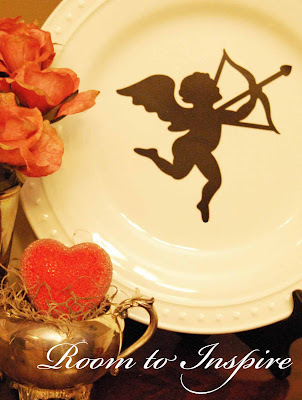 Love the cupid silhouette and it looks great on the plate! I am loving all the Valentine decorations lately. I still haven't gotten all my Christmas stuff down so it is hard for me to even think about the next holiday yet. Thanks for all your creative ideas!